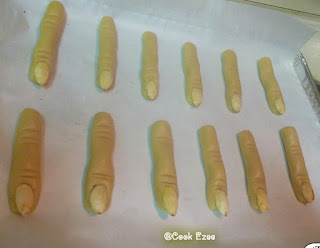 These witch finger cookies are simple cookies that I baked for this Halloween. We had a friends gathering and Halloween party over the Halloween weekend and I was suppose to make some snacks and any goodies of my choice. 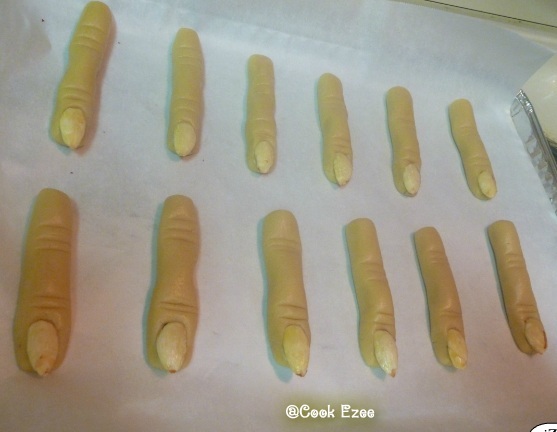 Since it was Halloween I wanted to give some creepy spooky effect for the dish I make and I found this recipe in Allrecipes website. After reading the recipe I knew it is a very basic simple cookie and thought of giving it a try. But must say I was a lot worried about the shape because I haven't done anything like this before and it is just hand made and there is no cookie cutter way of making it. 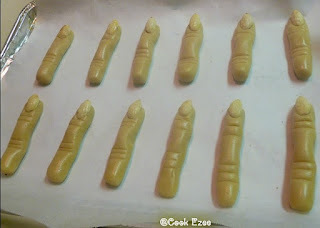 I decided to give it a try and planned moulding it into simple cookies if the finger cookie shape didn't work. Thankfully it came out good and I was really happy to take this for our Halloween party. Blanched almonds act as the fingernails for this cookie and I used red food decorator writer to give the blood effect around the nails. Some almonds came off from the baked cookies, I just dipped them in jam and fixed it back on to the cookie. This helped me to keep them in-tact. 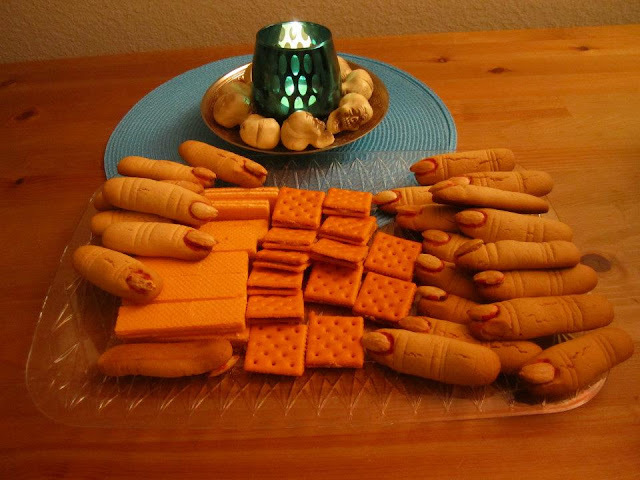 So let me add this recipe for this cute scary witch finger cookies. Enjoy!!! Sift together flour, baking powder, salt into a wide mixing bowl. Add sugar to this and mix with clean hands or spoon to remove lumps if any in the sugar. To the above dry mix add butter, egg, vanilla extract and knead well with your hands to make a smooth dough. Cover and refrigerate the dough for 30-45 mins. Pre-heat the oven to 325 degree Fahrenheit. Layer a cookie sheet with parchment paper and set aside. Take out the dough from the refrigerator and make small cherry size balls. Roll each balls lengthwise with your hands on clean kitchen counter top to look like fingers. 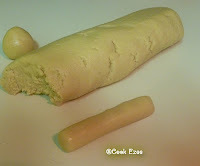 With a knife make three crosswise slits in the middle and two slits in the front of the dough finger. Bake for 20 mins or until slightly browned. 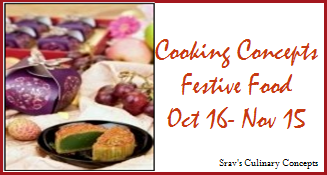 Remove from the oven and let it cool down completely. If the almond comes out of the cookie dip them in any jam and press them back again. 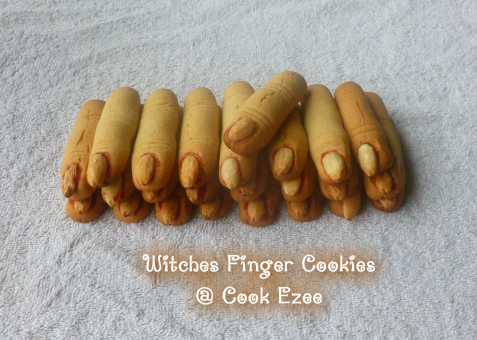 Scary witch finger cookies are ready..
Sending this to the event hosted by Sravani of Srav's Culinary Concepts "CC Festive Food"
Scarring Finger Cookies!.Happy Haloween Dear.Perfectly done and Luv the recipe too. These are real scary ones..You won't believe Pratibha ,I saw this in all recipes.com and thought will give a try this halloween but We had to shift the apartment and this got postponed..It has come out perfect and spooky for halloween!! Perfect baked! My first time here and look at what i am commenting on.. The fingers look really bad and creepy, making them perfect for Halloween. Am sure the little goblins would have enjoyed this treat.